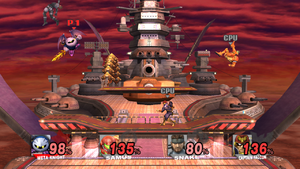 Halberd is one of the stages that appeared in Super Smash Bros. Brawl, based on Meta Knight's battleship of the same name from the Kirby series, which first appears in Kirby Super Star. 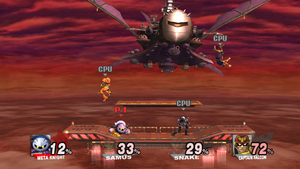 The stage itself is based on Revenge of Meta Knight, the game from Kirby Super Star the Halberd appears in. The ship is named after a Swedish axe-like weapon, as well as the developer of the Kirby series, HAL Laboratory. The stage starts inside of a hanger, the floor opening to reveal a platform that is similar in design to the Battlefield stage. The platform then raises and flies around the Halberd as it takes off over the ocean, where the stage is primarily set. Later in the stage, the platform lands on the Halberd itself. 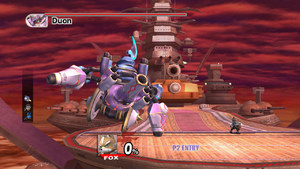 The stage continues to be a Battlefield-type stage; however, the background has an added gimmick. Combo Cannon, a double-barreled battery with an extendable robot arm, is in the background. It will occasionally shoot ray beams, missiles, and even attack with its robot arm. This causes severe problems for the fighters if they are unlucky or targeted. Players must use this strategy to make the weapons hit their opponents. 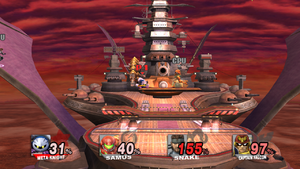 The stage reappears in Super Smash Bros. for Wii U. 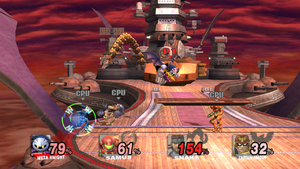 In this incarnation, the stage can only be played with four players in its normal form, but with a maximum of eight players in its Omega form. The Omega form of the stage is set entirely on the base platform that flies around the Halberd. 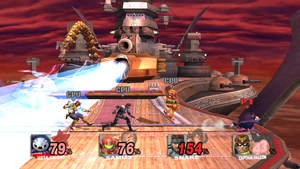 The Halberd reappers as a stage as well as a spirit in Super Smash Bros. Ultimate. 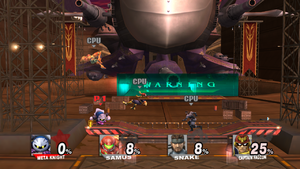 In the Subspace Emissary in Super Smash Bros. Brawl, it is taken from Meta Knight in a deleted scene, prior to the events of the game. It is first seen at the Midair Stadium, dropping off Shadow Bugs after Mario's and Kirby's fight. It is then seen in Skyworld, dropping off more Shadow Bugs. Kirby and the rescued princess (either Peach or Zelda), flying on a Warp Star, are chased by the Halberd. The Halberd destroys the Warp Star, and the duo is forced to land on the ship. Then, Fox attacks the Halberd in his Arwing but is swiftly defeated, knocking Kirby and the princess off of the ship. Later, Falco, Fox, and Diddy Kong ride atop the Great Fox and battle the Halberd with it, but the Halberd defeats the Great Fox, which crashes into The Glacial Peak. 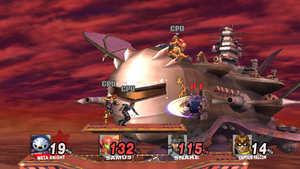 Because of this, Lucario and Meta Knight are able to climb aboard the Halberd. Solid Snake, who is revealed to be aboard the Halberd hiding in his box, comes out of hiding. Lucario and Meta Knight find him, and they engage in battle. They all learn that they are on the same side and fight their way through to the trophies of Princess Peach and Princess Zelda. Suddenly, Shadow Bugs come in and create clones of the princesses, which are fought by the three heroes. After the evil clones are defeated, Peach and Zelda are freed. 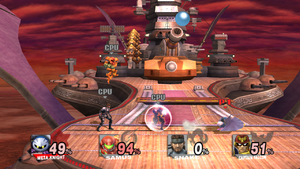 Lucario and Meta Knight then advance to the top of the Halberd while Snake stays for a while before going up, too. Zelda transforms into Sheik to hide from Snake, and she and Peach advance to the top of the Halberd. Meanwhile, Fox, in his Arwing, is trying to attack the Halberd once again. As the Arwing fires at the Halberd, it almost hits Peach, so Sheik jumps up and attacks it, destroying it. Fox and Sheik jump away from the Arwing, land on the Halberd, and try to attack each other. Peach promptly stops them. Meanwhile, Snake, Lucario, and Meta Knight reach the Control Room to find it filled with Mr. Game & Watches. Snake runs in and attacks them, making them all fly out of the window. Snake jumps out after them, landing next to Peach, Zelda, and Fox. All the Mr. Game & Watches turn into Shadow Bugs, creating Duon. 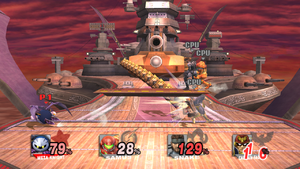 Falco arrives too, and they all defeat Duon. The trophy of the real Mr. Game and Watch is left behind. After this, Meta Knight takes control of the Halberd. It is seen for the last time as all of the ships charge into Subspace, and it is destroyed by the Subspace Gunship. The heroes' ships fly out of the Halberd and successfully ride into Subspace. The Halberd prepares to lift off. The Halberd takes off. The battlefield will move around the Halberd. The battlefield lands on the Halberd's bridge. The Combo Cannon fires a cannonball. The Combo Cannon attacks with its right arm. The Combo Cannon targets someone. The Combo Cannon fires a laser. The battlefield leaves the Halberd bridge. Duon is fought on the Halberd bridge. SNES Kirby Super Star The main gun of the battleship Halberd. As the name references, it has two guns--the top one shoots out slow-moving shells, and the bottom one fires a powerful laser. There's a mechanical arm at the base that is used to grab enemies and hold them to be blasted by the laser cannon. It has a wide attack range and once shot down Dyna Blade after she aided Kirby. SNES Kirby Super Star Meta Knight's battleship, built to help Meta Knight take control of Dream Land. It's crewed by Meta Knight and the Meta-Knights and is equipped with the Combo Cannon and a shrimplike robot called the Heavy Lobster. Kirby destroys the ship's reactor, causing the Wheelies who power the ship to flee. In the end, the ship crashes into the sea while the sun sets in the background. This giant cannon is the main weapon of the Battleship Halberd. Any invader will think twice when cannonballs and laser beams are brought to bear. You'll have to be really careful around these weapons, since even the platforms underfoot will try to lift you into the path of the beam. Watch out! This page was last edited on March 12, 2019, at 15:35.